The Jazzy 1107 easily disassembles to travel with you wherever you go. Yet, comes complete with advanced active-trac suspension. The Jazzy 1107, by design, offers the stability and performance of a full size, rigid frame chair. 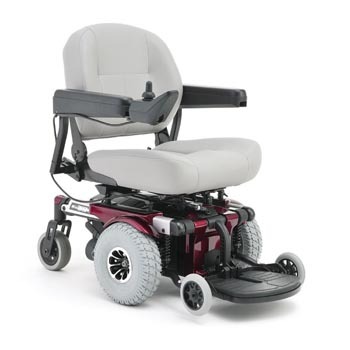 The Jazzy 1107 conquers a full range of outdoor driving surfaces as well as close indoor quarters with a 20" turning radius. The locking integration of four components provides outstanding rigid-frame stability. The Active-Trac and rear caster suspension performs aggressively over the most challenging terrain. The innovative design of the direct connectors for the battery packs and motor eliminate battery and motor wiring harnesses. Innovative battery boxes and front module eliminate battery and motor harness. The 20 inch turning radius makes the Jazzy 1107 turn on a dime and great for indoor use! Pneumatic drive tires and solid casters and anti-tip tires are standard. Disassembles for ease of transport. Aluminum frame rails and center locking mechanism provide a very rigid frame for ultimate stability. Advance Active-Trac suspension is standard and provides a smoother ride over rough terrain. Lifetime limited warranty on frame, 2 year limited warranty on electronics and 18 mos. limited warranty on motors. Per-charge Range Up to 25 miles.